The editors at Dark Moon Books have been talking about publishing a young adult version of our quarterly horror anthology, Dark Moon Digest, since our first issue. Well, nearly three years later, here it is. 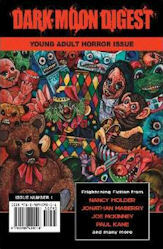 And we have some great tales to share with not only younger fans of the horror genre, but the inner child in all of us. This special issue brings us stories from Joe McKinney (Among Men), Nancy Holder (Are the Stars Out Tonight? ), C. W. LaSart (Creepy Town), James S. Dorr (Cyclops), Dawn Napier (Deadly Thin Ice), John Peel (Franklinstein), JG Faherty (Lonely Is The Mothman), Kevin David Anderson (Mounting Fairies for Display), Jonathan Maberry (Overdue Books), Kimberly Yerina (Rotten Inside), Jeff Szpirglas (Scratch), Sarah Ahiers (Smothered), Max Booth III (Super), Stacey Turner (The Nightmare Project) and P. B. Kane (The Rainbow Coat).